A few months back, we launched the HootSuite Learning program to offer comprehensive training for social media professionals about the nuances and features of HootSuite. We also sought to offer an environment to exchange ideas and discuss trends, tactics and strategies for managing outreach and listening activities. Now with the first batch of grads proudly displaying their badges, we’ve tuned up the Learning site to be a bit more “Hoot-like” with easier access to the courses, quizzes and the important directory of certified pros. If you are already a student, take a look and see what you think. Not a student yet? Perhaps you’ll be inspired to join up. 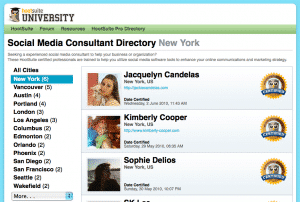 All graduates are listed on the HootSuite Certified Professional directory, plus you can identify them by the insignia proudly displayed on their websites. The list of pros are sortable by city and country so you can find a consultant close to your location as needed from USA, Canada, UK, The Netherlands, Switzerland, South Africa, Ecuador and more. Along with the quizzes and learning modules, HootSuite Learning provides students with “stories from the trenches” as told by an assortment of experienced marketers, authors and managers. As a recap: In the first month, Lewis Howes demonstrated the power of LinkedIn and shared tips on maximizing this popular business networking tool. Up next was Lisa Kacerosky from legendary curator of humor, Icanhascheezburger.com. Lisa blew the audience away by revealing the 50+ different profiles she personally manages using the HootSuite and showed exactly how one person can accomplish such a huge task. Then came Chris Garrett — co-author (with Darren Rowse) of the book “ProBlogger – Secrets for blogging your way to a six figure income — who discussed the business of blogging and creating compelling content for your social media channels. Following up with a different perspective was Rich Harris, the customer support manager at hardware manufacturer Seagate who discussed tactics for providing customer support using HootSuite. The latest speaker was Amber MacArthur, host of online shows, writer of columns and author of “Power Friending” who shared her insights about the power and benefits of networking. Next up is Sean Malarkey discussing ins and outs of Twitter and then an encore webinar by Lewis Howes. Plus Dave Olson, HootSuite’s Marketing and Community Director, has participated to share freshly released tools, as well as providing some context about how ideas become features in the HootSuite universe. Sounds great! 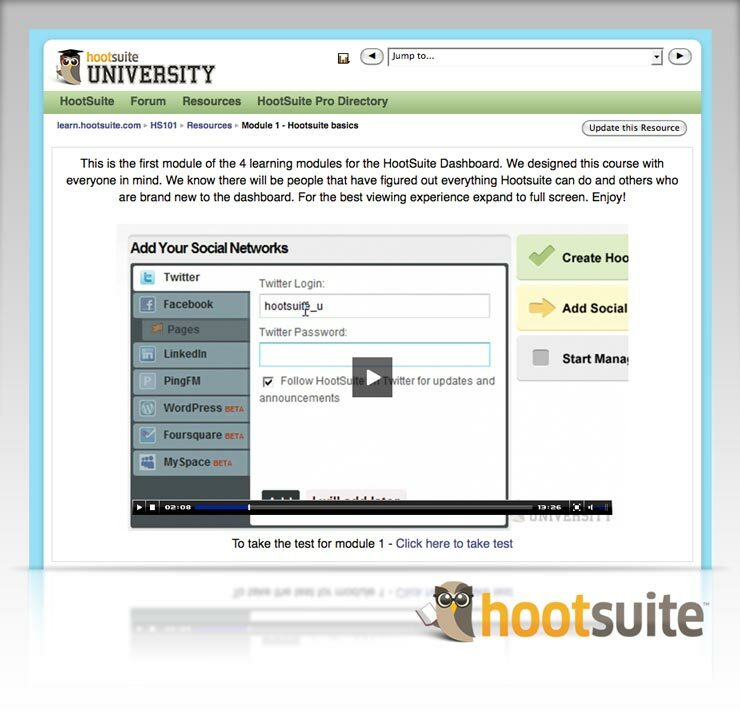 Get signed-up for the on-going HootSuite Learning University program for only $47/mo.